For many years I’d set my New Year’s resolutions during the last week of December knowing that I wanted to do better the next year. I promised to exercise daily and lose those extra pounds choosing to eat healthier. I’d start cleaning the pantry and fridge assured that I would be better organized the next year. And I’ll admit that I failed miserably at the challenges I had set for myself. Something was not included in my planning–the inner me. The person within that could hijack the best laid plans. December 2006 was a different year for me. Surrounded by my calendar, my Bible, and my prayer journal, I knew I wanted something different for the new year. Things needed to change. A relationship needed to change. I was at a defining moment with one of my kids — my prodigal — my “I’m going to do things my way and you can’t stop me, kid”. Oh, yes, I had tried to stop things. I had tried to cajole her to a different lifestyle. I had used every tactic in my arsenal of parenting skills and even with that I wasn’t making an impact. I had never prayed so hard for a person in my life. My prayers began with something like this. With that my prayers changed and my focus was different. That prayer became my New Year’s Resolution. It wasn’t about what I wanted to accomplish–the weight loss or the organization. It was about what He wanted to accomplish in and through me. Beginning in January, I took a different tactic. I focused on my past–the story that God had written for my life. What affect was it having as I parented? The next three months I cried more than I had in years. I let His story wash over me as I looked at my childhood through adult eyes. I better understood who I was and who God created me to be. I also began to realize the pieces that I had brought into my parenting–things I would have never given thought to without the overarching heaviness of my prodigal. I began praising God as I continued to go through the trials with my daughter. There was no doubt that I was changing. God gave me an empathy for my difficult child that could only come from Him. He gave me a different perspective and a softness that was willing to endure her gut-wrenching choices and remain by her side. Rather than the “you are doing this to yourself” speech, I was able to walk through the predicaments she got herself into holding her hand and letting her know that I was there for her. 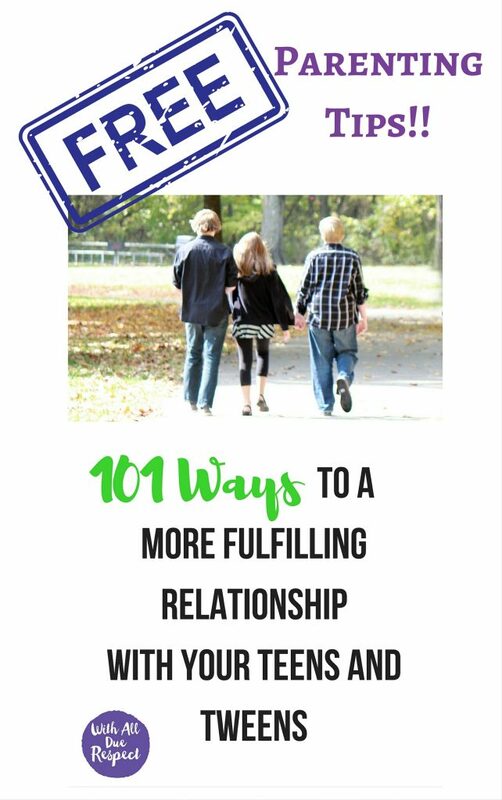 Whether you are dealing with a prodigal or are just wanting a better relationship with your tweens, teens, and twenty-somethings, the book With All Due Respect:40 Days to a More Fulfilling Relationship with your Teens and Tweens was my journey. It was the process that changed the inner me. It helped me see who I was in the relationship and it helped me change the outcome of my relationship with my daughter and my sons as well as my relationship with God. You see, as much as we’d like to, we can’t change our kids. However, we do have the capacity to look within and make changes early in the relationship that can make a huge difference in the joy you find in parenting. The change in you can affect a change in your kids in amazing ways. Why not start 2018 off with a New Year’s Resolution to focus on your relationships? I promise that if you do, you’ll see parenting from a totally different perspective and you’ll come to know the story He is writing for your life. We’d love to have you start your own mom’s group and go through With All Due Respect starting in January. 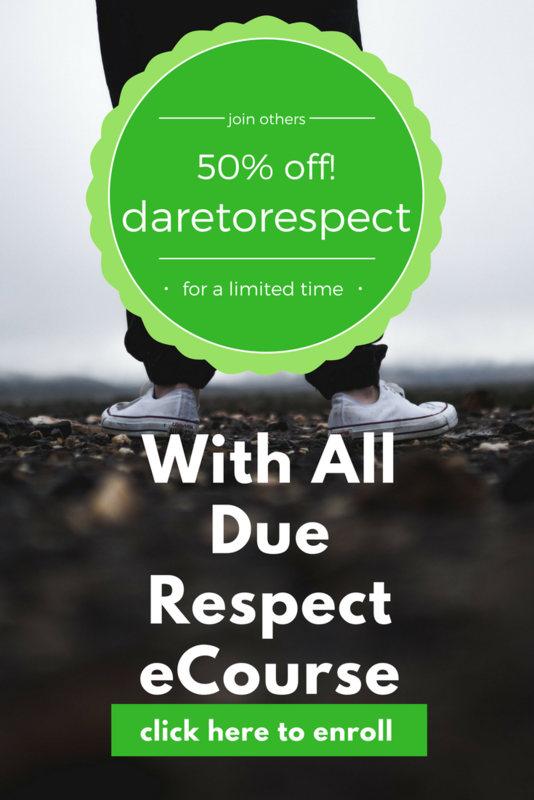 If others won’t join you, you can also join our With All Due Respect on-line e-Course that will begin in January. There you can join women from around the country from the comfort of your home. You can access the videos and discussion stream at your own convenience. Dare you to join us as God creates a new “inner” you in 2018.